The gold is absolutely beautiful. I love all the embossing and pasting. So pretty. Oh yes!! LOVE this!! So beautiful! Love all your stenciling and embossing techniques on your card…gorgeous. The sentiment on vellum and embossed with gold…stunnning. Gorgeous card, I love everything about it! So pretty in pink! Love that embossed background. So glad you joined us over at Mojo Monday this week! Ooh, such a pretty background! So pretty…love all the wonderful pink. Lovely card, gold embossing is always so pretty on vellum. super pretty, love all the pink! Hope it warms up soon! Pretty Pink card, Lee-Anne, love your combination with the gold embossing! Have a wonderful Tuesday and Happy Hopping! 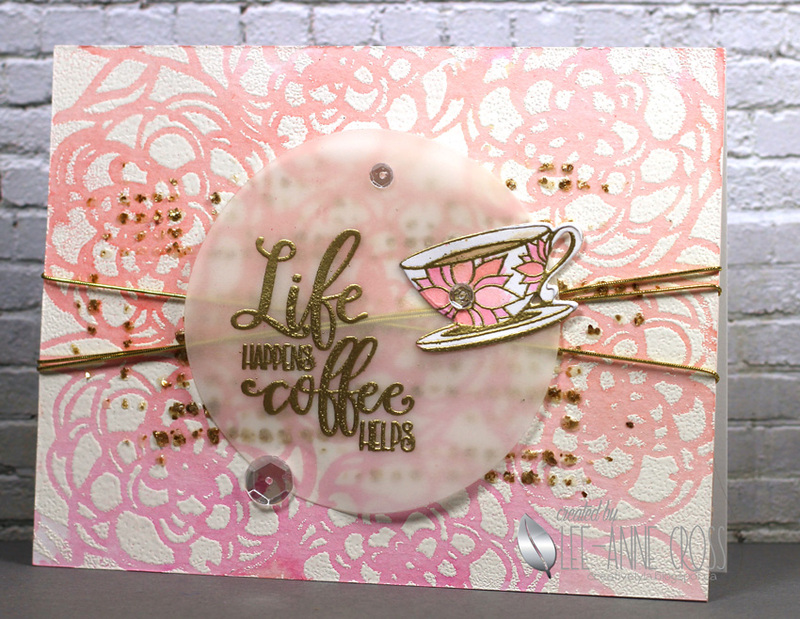 LOVE your background, LOVE your cup, LOVE your vellum sentiment panel, LOVE your colour combo, YES, I LOVE IT ALL!!! Oh, this is sooo pretty! Wow…I wanna come stamp with you. You could teach me so much! Am loving the “beverage series”! But particularly like the sentiment on this card and all the lovely textures. Especially appropriate today as I look out at the new foot of snow in the backyard. Tee Hee. What a cool background for your gorgeous cup! Lee Anne, this card is amazing! Love the gold and pink combo! Love this card, Lee-Anne. So feminine! Oh so cool! So beautiful. What a perfect pairing of pink and brown – with coffee. Cute sentiment! Love the gold with the pink,too. Thanks for joining us at The Card Concept! Oh wow, I am loving this gorgeous card!!! The gold and the pinks are beautiful together! Thanks for sharing it with us here at the Card Concept! Oh my,this is such a lovely background and wonderful how you added the image and the cu. Beautiful cup! Love all of the flowers. Very pretty! Love the pink & gold combo! Thank you so much for joining us at The Card Concept Challenge! This is pretty fantastic! Love the gold!!! Thanks so much for playing along with us at The Card Concept.